Spectacle Entertainment would pay $100 million to move the Gary casino across town, while losing the license for the Terre Haute casino. 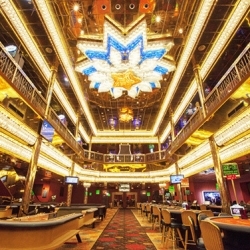 The Indiana House Public Policy Committee voted 12-0 on proposals that add tough new stipulations to draft legislation (Senate Bill 552) which would allow Spectacle Entertainment to move two of its casinos inland from Lake Michigan. The legislation now goes to the House Ways and Means Committee. Originally, Spectacle Entertainment wanted permission to move two of its Gary, Indiana casinos inland. Under the original proposal, one casino would be moved to Terre Haute. The second casino would be moved across town to a brick-and-mortar location. The moves would facilitate the expansion of Buffington Harbor into a shipping port, which would benefit the City of Gary. Spectacle Entertainment would benefit because its two riverboat casinos would become full land-based casinos, thus allowing for growth of the gaming space and the addition of modern convention space, restaurants, clubs, hotel space, and other attractions. The bill has had support in the Indiana legislature until now, though Caesars Entertainment (a rival in the state) opposed the move. Under the new terms drafted by the Indiana House Public Policy Committee, two new stipulations have been added to the legislation. One, Spectacle Entertainment would have to pay the state of Indiana $100 million for the right to move the Gary casino across town. Two, Spectacle Entertainment would have to give up its right to the Terre Haute casino (Amendment 60). Instead of moving halfway across the state to a new facility, the Terre Haute license would become available for bidding through a normal licensing process. That would allow the Indiana Treasury to pocket more cash in licensing application fees, or otherwise raise stipulations to allow the state to wring big licensing fees out of the developers. Also, it would introduce a competitive process, which naturally would lead to larger bids on the project. It is not known if Spectacle Entertainment would be allowed to bid on the Terre Haute project or not, or whether Spectacle would want to bid on a license it once had. The fact the casino company had done enough research on Terra Haute to petition the government for a license there suggests Spectacle Entertainment sees the casino location as profitable. The committee discussed adding a $50 million fee to the Terre Haute casino move. Instead, the Public Policy Committee decided to leave that decision to the Ways and Means Committee. Several other changes were made in Amendment 60. The mobile sports betting provisions were entirely struck from the bill by State Sen. Jon Ford (R-Terre Haute) and State Sen. Mark Messmer (R-Jasper). The provisions which would have compensated other casino operators for damage to their business by the moves also were struck from the bill. The central Indiana city should come out well in the deal, if the current provisions hold. If the licensing process goes to a bid, Terre Haute should get a bigger casino resort, which translates to more construction jobs, more investment dollars, and more permanent jobs once the casino is complete. Also, a top casino company might end up the winner of the bidding process, further enhancing the bid. Two other amendments were adopted for SB 552: Amendment 50 and Amendment 65. Amendment 50 would allow funds from sports wagering inside Marion County to go to the Marion County Housing Trust Fund. Previously, representatives from Marion County were concerned whether sports betting dollars would be attributed to the correct programs. Amendment 65 is a charitable gambling bill. The clause would create charitable gaming licenses for veterans and fraternal organizations, a stipulation which is common in states across the Union. Veterans’ organizations and fraternal organizations would be able to organize charitable gambling events to raise money for the various philanthropic causes that the organizations support. The inclusion of Amendment 65 is certain to make Senate Bill 552 more popular with lawmakers and voters alike.